Nick Drake and Jim Morrison share a similar face and long hair. They also share two other unfortunate attributes. Depression and untimely death. 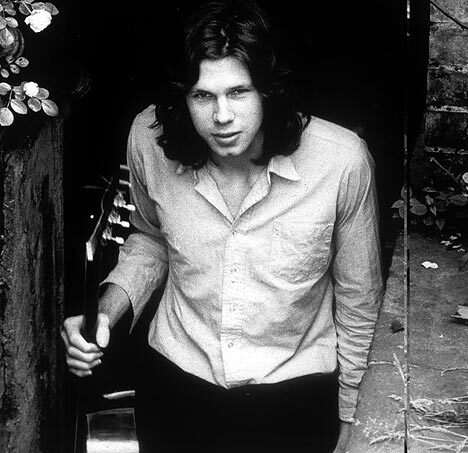 Morrison died in 1971 and Nick Drake in 1974. Two great talents eradicated. But Jim Morrison is a well-known superstar. His brief work with the Doors made him more of a mysterious idol in his death. Nick Drake, on the other hand, remains practically anonymous, his tranquil compositions often falling into obfuscation. Luckily, his work has been posthumously praised and while not many listen to Drake’s harmonious tunes, many critics rightfully consider his work to be that of a depressed genius whose sheer confidence in his talents was often overshadowed by his misanthropic attitude. After releasing his third album he fell back home with his parents and took his own life two years later by way of an overdose on a prescribed antidepressant. He was 26 years old. I would like to travel back to 1969 and feature the last track on his first album Five Leaves Left. The album demonstrated an unheralded mastery of folk/rock from the 21-year-old Drake. It did not receive much admiration at the time, but years later it garners tremendous praise. The last song “Saturday Sun” is a melancholic track, slow, sensual and constant, like delicate waves lightly touching a sun-drenched shoreline. The piano’s bluesy sentiment provides a strong opening. Drake’s mellow and gentle voice is indescribable. There is a sad beauty to it. You can almost hear his inner torture. The song leaves any listener stung by its calmness and full beauty.